Trenton's Old Barracks: Preserved in Perpetuity ~ The History Girl! Standing in the shadow of the New Jersey Statehouse is a very important piece of New Jersey military history. 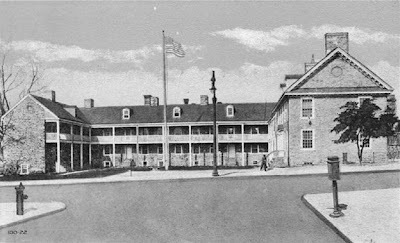 Of the five pre-revolutionary barracks constructed to house soldiers throughout New Jersey in 1758, only the Trenton Barracks remains. More than early New Jersey military history, the barracks also represent an early and successful effort in historic preservation. 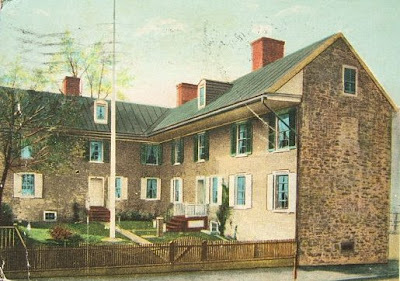 The barracks at Trenton were built in 1758 in an effort to relieve colonial citizens from the quartering of troops in the winter during the French and Indian War. The law which provided for the erection of the barracks was passed by the Council and General Assembly of the Colony, April 15, 1758. In addition to Trenton, New Jersey constructed barracks in Burlington, New Brunswick, Perth Amboy, and Elizabethtown. Originally a U-shaped building, the Trenton Barracks was constructed of rubble fieldstone and two-and-a-half stories in height. The woodwork was painted a dark red color. The Barracks was the biggest building in Trenton at the time, capable of housing three hundred soldiers. There were approximately twenty soldiers' rooms, each with two windows, a door and a fireplace. Twelve soldiers were housed in each room. The rooms were furnished with bunk beds, two to a bunk. There was a kitchen in the cellar, but most soldiers would have cooked in their rooms. Each soldier received rations of food, firewood, candles, cider, salt, and vinegar. In 1759, an Officers’ House was built. This five-bay, Georgian style home was added to the north wing. The Officers’ House was more accommodating than the barracks, allowing for privacy and overall better living conditions. Roughly three hundred British and Irish soldiers were the first to occupy the barracks. The barracks were occupied by various companies of Irish, Scots, and British soldiers for three winters between 1758 and 1762. By 1765, there was no apparent reason for the barracks and the Legislature passed an act directing the Barrackmasters, William Clay and Abraham Hunt, to sell the furnishings at public sale and rent the buildings. However, this venture was not very profitable, as more money was spent in repairs than was received in rental. The barracks were not used again until the Revolutionary War. British prisoners of war from Canada were imprisoned in the Officers’ House while four companies of the Second New Jersey Regiment of the Continental Line were trained. Trenton was occupied by British and Hessian soldiers in December 1776. At that time, some soldiers stayed in the barracks. However, their stay did not last long. On the snowy and cold morning of December 26, 1776, General Washington regained Trenton and captured many of the Hessians. Under Washington’s watch, the barracks became an army hospital in 1777. Congress ordered Dr. Bodo Otto to Trenton on February 17, 1777, to establish a military hospital for the treatment of smallpox. Otto was a Senior Surgeon for the Continental Army. His three sons followed in his footsteps as physicians for the Army, and assisted him as Junior Surgeon and Surgeon Mates. Dr. Otto remained in Trenton until September 1777. The hospital was in use until 1781. After the Revolution, the barracks was sold on January 1, 1786 to William Odgen and William Harrison for three thousand, two hundred and sixty pounds. It was divided into private homes. When Trenton was named the State capital in 1790, and a site was chosen for the State House in 1791, and a forty-foot section in the middle of the building was torn down to allow Front Street to run through to the State House. Each wing was converted into residences. Many families lived in the small apartments in the two parts of the original barracks on each side of Front Street. The interiors and exteriors of the building changed in many ways: porches and inside walls were put up and taken down; chimneys and roofs were rebuilt; doors and windows were moved; and even a third story was added to one section. From 1857 to 1899, many elderly women lived in the southern wing which was purchased by the “Trenton Society for the Relief of Respectable Aged and Indigent Widows and Single Women." The southern wing was often referred to as “Whitehall.” The Officers’ House served a school for a short period. When the Society moved to a new building on Spring Street in 1902, the southern wing was put up for sale. To keep it from passing into the hands of speculators or contractors, and save it from destruction, a committee was formed, headed by Mrs. Beulah A. Oliphant, assisted by Mrs. Cornelius Hook, Mrs. James B. Breese, Mrs. Washington A. Roebling and Mrs. William S. Stryker. This committee of wealthy women raised the necessary funding and purchased the property. On June 13, 1902, the Old Barracks Association was formed. The north wing was purchased by the State of New Jersey in 1914 and the State agreed to start a museum. The building was restored as some thought it must have looked in 1758, with a rebuilt middle section and new corridors, balconies, windows, and landscaping. The 1914 deed to the building specified that the State of New Jersey owns the building, is administered by the Old Barracks Association, and financially supported by the State in perpetuity. The Old Barracks after restoration, circa 1930s. The Old Barracks was listed on the New Jersey Register of Historic Places in 1970, the National Register of Historic Places in 1971, and obtained National Historic Landmark status in 1972. The second restoration of the barracks began in 1985 and ended in 1998. During the restoration, a major archaeological investigation uncovered the original level of the parade ground in front of the barracks and the location of the fence that surrounded the structure during the French and Indian War and the American Revolution. The work also revealed the roadway built in 1792 through the barracks, foundations of nineteenth century buildings, a 200 year old leather shoe, barrel staves, and artifacts pre-dating the barracks, including pottery shards and a Lehigh broadspear point from Native American occupation of the Trenton area. Today, the restored barracks enable visitors and schoolchildren a glimpse into the rough conditions soldiers faced living in cramped quarters during the American Revolution. The building stands because of a committee of determined women, who almost a century ago, possessed the foresight to save the building from further deterioration or total destruction. Their efforts must be applauded as early preservationists for this rare, one-of-a-kind barracks building from the time of our nation’s birth. Wow, I never knew the barracks were split in half! Thanks for the article history girl.